MUFF WIGGLER :: View topic - Live improv vs pre-made ideas balance? Live improv vs pre-made ideas balance? The main question I have is about how much of it should be improvised. I tend to not perform much (only school concerts and the like in the past), and modular is definitely another kettle of fish to piano or guitar. Having read through a lot of posts here, I've come to the conclusion that improv is much more interesting than bringing a pre-patched setup and pressing 'go'. My music tends to be based on melodic sequences, and I like to have many, with slight variations in notes, and then switch between them. On Mother 32s, you can't create sequences while another sequence is playing, and the keyboard is not playable enough to use it live (imo). So how much preparing do you guys think is ok to keep the set interesting enough while not too repetitive or broken up by me trying to quickly program another sequence? I'm considering getting a mini keyboard for live playing so that I'm not just pressing 'go' on pre-made sequences and then wiggling the Cutoff knob now and then, but I'd rather not if possible as money is tight at the moment. So much depends on what kind of music you make, what kind of environment you are playing it in and how much and what equipment you have. There's a big difference between playing an ambient / drone set to a bunch of people sitting on the floor in a chillout and 500 people dancing to techno in a club. I do the latter mostly, and have two set-ups, one a hybrid /semi-improvised rig and another 100% totally improvised analogue with nothing saved, I dont even have any modules I can save anything in, so I have to make everything including sequences up on the spot. I always prefer to use the full improvised rig whenever I can but I have to have a big set-up to be able to have enough possibilities to keep a dancefloor engaged for 60+ minutes. For this to work I need lots of modules which make it easy to have as many routings as possible without major re-patching, in other words, matrix mixers, switched mulitples, precision adders, switch matrices, VC switches etc.. and I have to practice for months before a bunch of gigs, so that I'm totally at ease with my instrument and in full command of everything. I would say that if you really want to improvise, and you're performing in a dance environment, work towards it gradually by building your rig as an improvisational instrument as you go along. There's nothing wrong with having preset sequences etc.. if you are limited to that by your kit... but total freedom is the long game and could take years to achieve. if you're making ambient music, its going to be a lot easier to fully improvise and with much less gear. As a spectator I wouldn’t care about any of that. I’d want the music to be interesting and/or good. I guess you’ll have to ask yourself if you can create something worthwhile on the fly. Before I got my modular I had ready made patterns that I used as a starting point for my performances. If I’d do live gigs with the modular I’d probably go for something like what mylarmelodies showed off in several videos, a pre-patched improv setup. personally I enjoy live patching more than pre made patches, maybe something about how it all starts empty and transforms into something rhythmic or melodic and knowing that it was created on the spot. For an upcoming noise show I'll have some scales set in rene, states/banks in tempi, preset voltages in pressure points, and some reels for the morphagene. all of my sequencer modules are in a 3U skiff so anything between then will be pre-patched, from there ill live patch to rest of the system. It's not as dynamic as creating the whole thing on the spot, I'll have a general idea of what parts are going to happen. hopefully ill have stepped through the ideas a couple times so I know where I'm going, but depending on the mood the artist playing before me sets I'll adjust accordingly. As a spectator I wouldn’t care about any of that. I’d want the music to be interesting and/or good. Surely that goes without saying, thats the basic starting point. It has to be interesting and good. Some people obviously dont really care about what you're doing, but others do care and are really interested. If you're going to bother taking live equipment to a gig then I think its important that you're doing something with it that is visually interesting, or you may as well play your music off a USB stick. If you go to see a live band, you want to see them play their instruments, its why you went to see them play live. Live improvised performance is a dying artform, its too easy just to play it safe with the technology we have now. There is a great quote in the new Wire magazine... Its by the UK saxophonist Lou Gare: [...] improvising was not a matter of playing what you want. Rather, it was what the music wants that counts, but if you play what the music wants, you discover this is what you want afterall." Well, no. To many modular performers it seems to be more about what is interesting to them than to the spectators. Also, many seem to think that improvisation makes a performance interesting full stop, I totally disagree with that. As a spectator I don’t go to gigs to actually see the bands play their instruments. I want to hear great music, however it comes about. 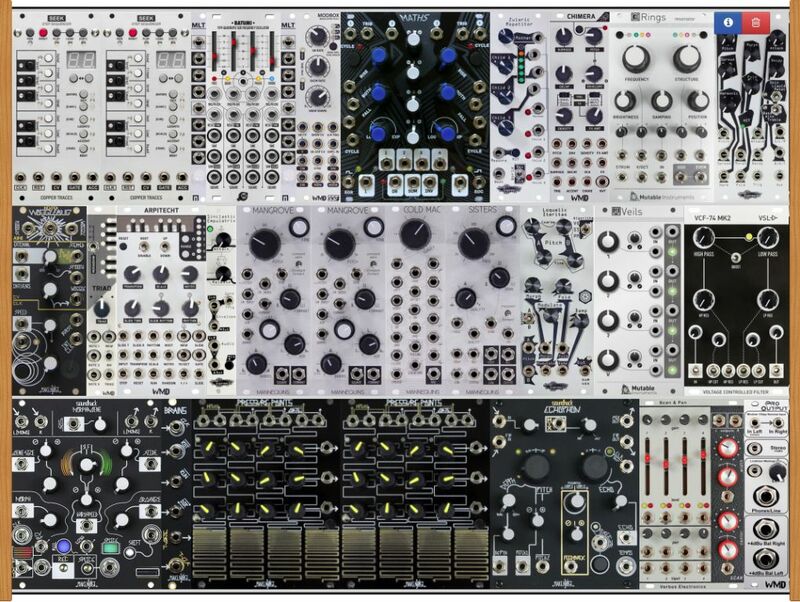 And sure, if you have a gig at a modular meetup or something like that, people will be more interested in your gear and your methods than your music. But that’s mainly a bit sad imo. Thanks for the detailed responses guys! So far from what I've read I think I'll be starting with premade sequences, and some prepatching of modules to outputs so that I have the voices ready to improvise with, and then go from there however I feel the music and energy in the room pulls me. It'll be an ambient set, but not the '60-minutes-of-clouds-and-808s' type. More like a melodic set, but very moody and atmospheric. I use an Eventide Space and Timefactor to help my modest setup achieve this. I honestly know nothing at the moment about what the environment will be. I will ask when the show organisers have more answers, but for the moment I'm thinking I'll bring some LED strips with me, since a dark room with multicoloured LEDs is a quick way to get atmospheric! My setup most certainly is not built for performance - it was originally to be used just as a monosynth in my studio, but I quickly found it fun to create self-generating ambient patches and the like. Personally, I quite like the idea of having a small setup (not just saying that because I can't afford more, honest ) because it pushes me to be more creative, and my ego likes people saying 'wow, you did all that with only that much?'! 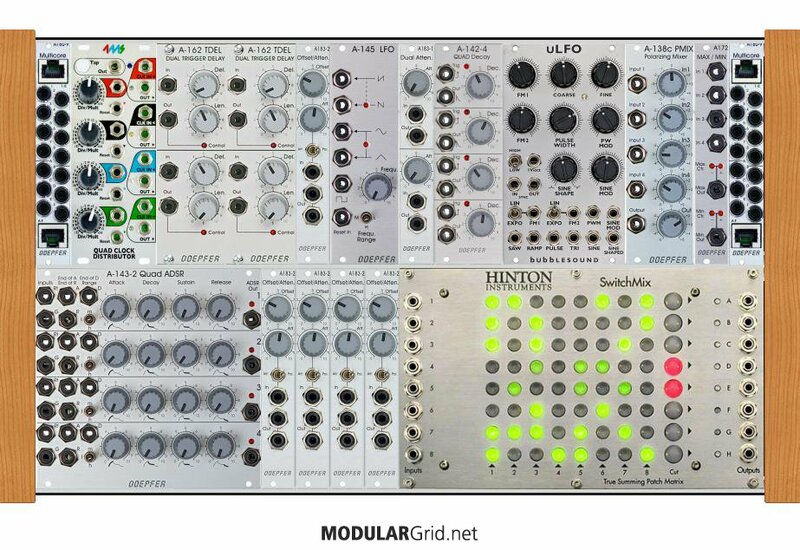 The modules always end up linked with each other in a lovely way that I know wouldn't happen if I had a wall at my disposal, or even a 12U travelling case. Having said all that, there's a line at which you can't do much improv performing with your setup and I think I'm nearer that line than I'd like to admit. However my set goes, I'm going to take this advice to heart and perhaps build another small case of performance modules like you've listed. Repatching scares me due to how many times I've got crackles and glitches as I patch a cable in - I don't want that live. And sure, if you have a gig at a modular meetup or something like that, people will be more interested in your gear and your methods than your music. I feel like this may be the crowd, but that just makes it more of a challenge to make them appreciate the music, because it's certainly the music that I think is more important! Also, many seem to think that improvisation makes a performance interesting full stop, I totally disagree with that. I've not seen anyone else actually say this, despite it being on my mind. Do you mean entirely improv, with no idea where you're going, or does this also include having a rough plan of mood/genre/patterns/voices and then improvising around that, in your opinion? I just wrote all this, and then looked up at the cat in the last post for a second and realized the post was by Steevio!!!!! Steevio, get this man an autograph! This is just a sweeping generalisation based on your own experiences, not taking into account that we all come from different countries and scenes etc.. and assuming everyone in the modular scene is like the people you know personally. I dont think that improvisation makes a performance interesting full stop, no way, but there are alot of people interested in improvisation in electronic music, and want to promote it, infact I run an electronic music festival that has at the heart of its booking policy 'as much live improvised music as possible'. I also get booked for gigs and make a living on the strength of my improvisational performances, thats why promoters book me, and these are techno clubs, we arent talking modular meets. Its a popular misconception that only a handful of nerds are into this stuff, and nobody cares what you do on stage.... in my experience. Very astute words. I couldnt have summed it up better.. I was also originally a drummer, and guitarist (rock not jazz) and the one thing I missed when I switched to electronic music was the adrenalin and energy on stage from knowing that you had to perform, there was nothing to fall back on, its was all down to your musicanship. So as soon as I could introduce the ability to improvise I did, and have been building my system with that in mind for many years. Repatching scares me due to how many times I've got crackles and glitches as I patch a cable in - I don't want that live. Ive just built a 6U Modulation matrix case. It has everything in it to do modulation duties, LFOs, clock dividers, trigger delays, Quad ADSRs, offset generators and an 8 x 8 switch matrix. So I can send any modulation or combination of modulations to anywhere in my rig. Its actually revolutionised my ability to keep things happening through my sets, its become like my main control panel. I can even control the direction and step length of my sequencers using ADSRs from there. This would be way too elaborate for a small rig, its effectively an extension of my 36U live rig. Its connected by RJ45 multicores from the A180-9s. Its also a big investment money wise.. It wouldnt be difficult to build a trimmed down simpler version of this, the most expensive part is the Hinton Switchmix. Thanks for sharing, I always enjoy seeing other wigglers' cases when I know what their function is, it's an interesting insight. But man is Steevio right, there are so many different kinds of music, and venues, and audiences... What works in one realm may not work at all in another... My musical life started with pretty traditional Jazz, then I spent a decade in NYC doing free music.... But even with totally free music I tried to think compositionally, with a theme... I am interested in more abstract, ambient, music with the modular, but rooted very much in polyrhythms... Will be interesting to see where it goes…. Have enjoyed reading the posts herein because its really opening me to new possibilities, new ways of thinking…. Surely that goes without saying? I guess that what you're stating is based on peer reviewed quantitative research published in The Modular Review. Well, I know about you Steevio and I know that you have a lot of experience in this field. I have quite some experience myself and not only from "people [I] know personally" but surely nowhere near yours. I'm also sure that many of your points are valid, even if I disagree with some of them. I'll leave you to dishing out your excellent technical advises in this thread, without further interruption. I'm also sure that many of your points are valid, even if I disagree with some of them. I'll leave you to dishing out your excellent technical advises in this thread, without further interruption. People like you give me the confidence to post on threads! I'm also sure that many of your points are valid, even if I disagree with some of them. Of course it's normal to disagree, life would be boring if we all agreed all the time. I'm only really pointing out that there are clubs, festivals, parties where people do care about artists playing live, and really appreciate it, even if they arent the places you go to personally so maybe you havent experienced them. I played at Bloc festival in the UK and the Weather Festival in Paris on stages that were 100% modular, and live, and at Bloc found it difficult to leave at the end of the night due to the number of people who were asking questions about the live set-ups there. In the UK at least there is great interest in live electronic performance, I just think its worth pointing this out. maybe you need one of these. I just got one recently and its fantastic, you can make up any scales you want including microtonally. Its also really nice working with just intonation, and harmonic scales instead of 12Tet, and you can do it on screen which is really clear and detailed. you can find out about it in the Tubbutec subforum on here. Its definitely not perfect, and there are some things I REALLY wanted that don't fit.... Seems almost like a game of tetris, though everything is square/rectangle... A lot fun to build over the last six months or so, but even more fun to use... Can't wait to play live with it!! Interesting topic. Premeditated/improvised but also the range of preferences and the varied solutions. For a year or so I've been paring things down to make a nimble setup designed for improvising. Massive generative patches can be replaced by people! 1 A source of drones, bug noises, outer space, more. 2 Ribbon patch for soloing (slowly building skill). This can double as a drone. 3 Fairly basic "beat" patch (synth building blocks pretending to be drums). 4 Piezo amplified metallic stuff (boink, tink, scratch). 5 Simple filtered noise with an LFO. No presets, very analog sounds, mono, more effects than you might expect. Some sources must be played by hand, in the moment. Some can run continuously but to stave off boredom you must introduce changes. There are a number of clock and LFO signals kind of miraculously (Modbox) coordinated from one master clock. Fairly regularly I get together with a horn player, violinist and sometimes a percussionist and we make things up. On one level I'm listening and responding to the musical elements and on another level I think in terms of sound design. Later in the year I may develop a separate "automated" system, with small sequencers, logic, random/chaotic, stuff, etc. Ideally it would be something a Subotnick fan would enjoy and the two systems would complement each other.